In the aftermath of Aftermath, we all took a little break and in that time caught a fresh vision for what it is that we do, why we do it and what it means to be a part of the church; not just our church, but 'the' Church. To be called God's people and to be a part of what He wants to do. Zion. It's an interesting word, with several meanings and connotations. We read about it, sing about it and even wonder where it is. In Biblical terms it is the hill on which the city of David was built and perhaps where the Ecclesiastical meaning of the highest place, or Heaven, comes from. Zion is precious to the heart of God and it's essentially what Jesus came to establish - Heaven on earth. God is birthing His kingdom in us and through us here on earth and that is exemplified through what Jesus is about: mercy, love, forgiveness, generosity, justice - all of those things - and that's how we are called to live our lives. We get the chance to be a part of building God's kingdom here on earth. The whole point of this album is the realization that God is doing His thing, and He has already done it, He is establishing His Church, and it's through us. The album was birthed out of our cry, "God I want to be a part of what it is you're doing, if that means write a song, we'll do our best to write the best songs we can. If it means serving the poor and those who are hurting, then we're going to do it better than we've ever done it before. If it means just being a great son or daughter, brother or sister, mum or dad - wherever it is we find ourselves - then let's do that better than we've ever done it before. Everything we do as UNITED, whether it be from recording or writing these songs, to playing them in front of people and all the production that goes with it or whatever part we play, it's all an expression of a really extraordinary God doing what only He can do through really ordinary people who love Him and want to serve Him. That's our desire, it's always been our desire and that hasn't changed; that's been the one constant. I hope these songs, in some way, are an encouragement for people everywhere. About "Hillsong United 2013: Zion (United Live Series)"
Customer Reviews For "Hillsong United 2013: Zion (United Live Series)"
Hillsong United's Album has touched my heart with their lyrics and allowed me to think alternativelychallenged me to ask God questions and see who is in my tangible relationship with Him. The music helps me see His love more clearly and in a more real way. 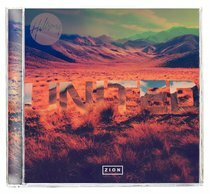 United have really created a beautiful album of talent that God has blessed them with in 'Zion'. Ugh yeah I personally don't really like electro, which this whole album is, (kudos for trying something new), but the songs themselves can be quite catchy otherwise, such as Relentless, and 'Oceans' which is an amazing track and is on the new album 'Glorious Ruins' which works out better for me. I would rate this album average at most. I haven't been impressed with Hillsong's music in general the pass few years. I mean the lyric sheets read wonderfully but the music is just droning, disruptive and not very.. hmm.. 'musically talented'. I mean if you can learn 4 chords you can play half of their music already. This album departs from that into very folky type arrangements and lyrical structure, but the electro vibe and punchystabby percussion on some tracks is just too much. If that's your thing, this would be perfect! I guess it's unique in that sense and so, there's some credit! 3.5 Stars! This album uses more of the electronic sounds. For those of you who likes the effects of a pad or synthesizer, then this album is for you. For everyone else, it might be a little too much effects. It's still a good album, maybe just too "uncontemporary" for my liking. I can't believe that no one has reviewed this yet! I love this CD. It has a great mix of songs on it. My favourite is track 4 - when oceans rise. This song has a calming and relaxing mood to it, and the words are of persevering in any situation BY FAITH. There is a cohesion to the selection of songs, which is quite nice when sitting and listening to the album as a whole. The album is a mix of praise and worship, with a contemporary feel to it. I would definitely recommend this album to anyone looking for a great mix of praise and worship music. And also, of course, I would recommend it to any fans of Hillsong music.